It’s human nature to collect things ­– from stamps and spoons, to countries visited – so when you start travelling it’s natural to first look at the world as a series of boxes to tick off. Once you’ve been somewhere you might think you’ve “done” it. Move onto the next country. Why go back? The first and only time I visited Thailand was the start of a six-month journey from South East Asia to Japan, the longest I’d ever spend travelling. I waddled out of the airport into the buffeting humidity like a lost turtle; my huge shell-like backpack – loaded with the kind of equipment you’ll find near the register in an outdoor store but never use in reality – made me perpendicular as the sticky Bangkok weather drenched my clothes. I lugged that 20-kilo millstone from north to south, then down through the islands off Phang Nga and Krabi. It almost fell off a ferry between the islands, obstructed the walkways of overnight trains, acted as a shield during Songkran celebrations, and blocked up bungalow wall holes to stop snakes getting in. The backpack represented how I travelled then – overstuffed, rough, on the fly, cut-rate. 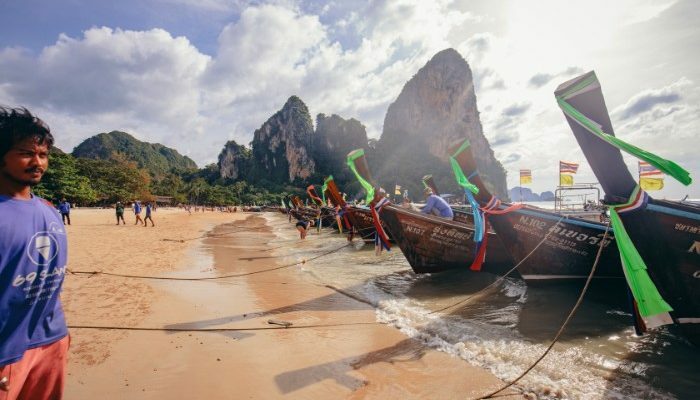 At the end of 2018 I took the chance to go back to Thailand, but in a very different style to all those years before: on an Adventure Cruise. I dug that same backpack out of the bottom of a cupboard in preparation, mostly for the nostalgia factor woven into it. When I first purchased it, I would have wondered why I’d return to the country – surely I’d already ticked it off. But while the luggage might not have changed, how I travel has. I might still have that urge to collect things – but now it’s new experiences, not countries. These days I don’t want to have to practice the bag contents rotation technique – I’d like to actually be able to unpack at some point. No longer do I unearth the big guidebook from the bottom of bag to decide where to go next – I’ve learnt to lean on the knowledge of locals. I want to see things from a perspective I wasn’t able to have before, and I’m ready for the upgrade to a few more creature comforts. 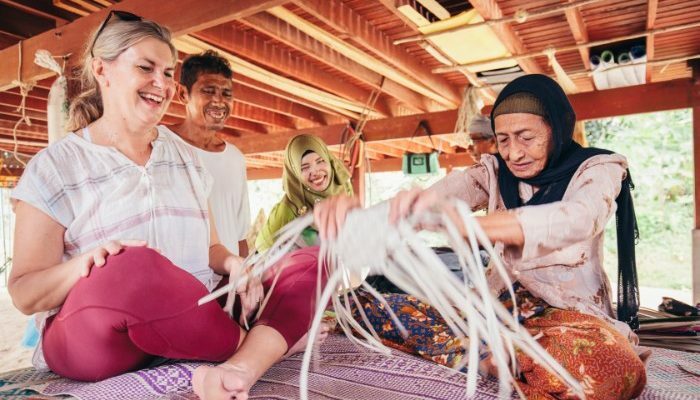 I found that satisfying these new needs in Thailand – along with some that don’t change (for adventure and surprises; to feast upon vast arrays of local flavours; to meet and make new friends) – was just an anchor away. Up the gangplank of a 160-foot yacht, at an unassuming dock in the south of Phuket, I trotted that trusty old backpack, knowing that if it was capable of feelings, it would have immediately felt out of place. This was unlike anything it had ever been on before. Something you’d normally see docked in the port of Monaco. On loan from the Mediterranean for this first season in South East Asia, the sleek Panorama II was my first dip into the world of cruising, and totally at odds with cruise connotations in my mind. There was no mass migration-like scene here, like you might get with other boat boardings. Instead, the other early-arriving travellers (of 48 at the most) and I were personally greeted by the hotel manager and staff, my luggage whisked away with barely a notice. With a humidity-beating, very welcome Welcome Cocktail in hand, I navigated the sweeping, sunlounge-filled foredeck, slipped past the friendly crew making last-minute adjustments, and headed through the cool, comfy lounge to my cabin. While the millionaire’s-personal-yacht feel decreases a little down on the lowest deck, there’s still a cosy double bed, looked over by a light-welcoming port hole, a positively roomy bathroom, and enough storage that the backpack was quickly emptied and hidden away for the rest of the trip. 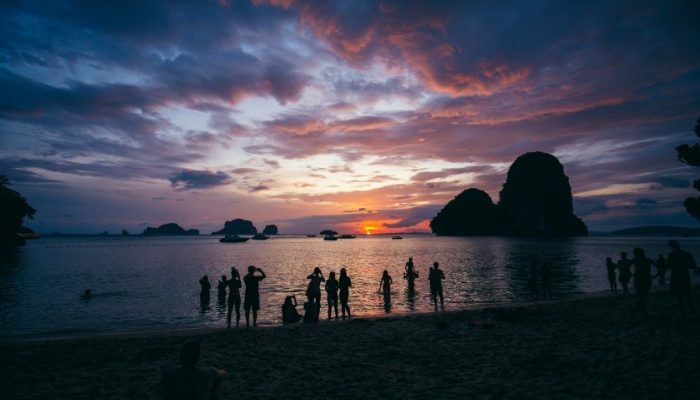 A first Thailand trip often follows a well-worn path through the likes of Bangkok, Chiang Mai, and islands heaving with partiers. But the beauty of this return adventure was not only that it was going to places I’d never been before; they were places I would never have really been able to go before. 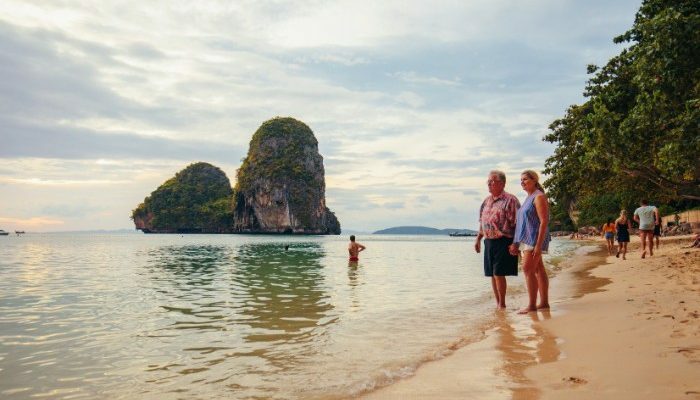 Thousands of islands cluster in the bays and along the southern coasts of Thailand, and many have resisted the pull of mass development, thanks to the locals, or the protection of the national park system. Without lots of luck, time, and endless switches between motorbikes, buses, taxis and longtails, these islands are virtually inaccessible. But these are restrictions for those that don’t have access to what’s effectively a private yacht, the years of knowledge packed into the minds of a couple of local leaders, and the flexibility to change destination mid-sail. We started like the itinerary read, hauling anchor and cruising to the shores of quiet, local-focused Ko Yao Yai. Here the already tight, story-swapping group of 26 ducked through jungles, learnt local crafts and tried sticky, pitcher plant-wrapped sweets. After zodiacing to the mainland to share a flavour-packed meal with a family in their home, we set sail again in the clutches of the Andaman Sea. But this sea isn’t always as welcoming as its stunning shifting colours might suggest. 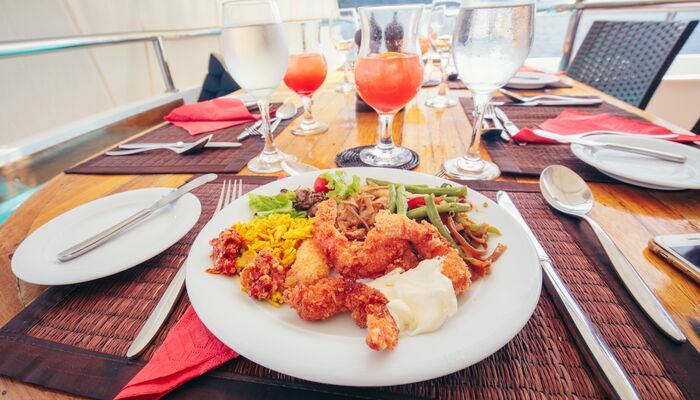 After one of our on-board al fresco dinners – plates piled high with fried prawns the size of fists, fresh calamari, spicy noodles that zinged with a crisp beer – the captain and his first officer unrolled a large map. The complicated series of screens and dials in the bridge – which was always open for us to visit – had warned of a stormy swell standing between us and our planned next destination. But we can go here, here, or here, the captain said tapping the map. The sea was our oyster, and we could cruise to any of them. Later, as we dive off the ship’s stern into calm waters, kayak towards coral reefs, look down on fish as if standing on glass, and walk along untouched sands, the idea that I’d ever questioned returning to Thailand drifts away like water on the shore. You’ve just got to find someone who matches how you travel now. 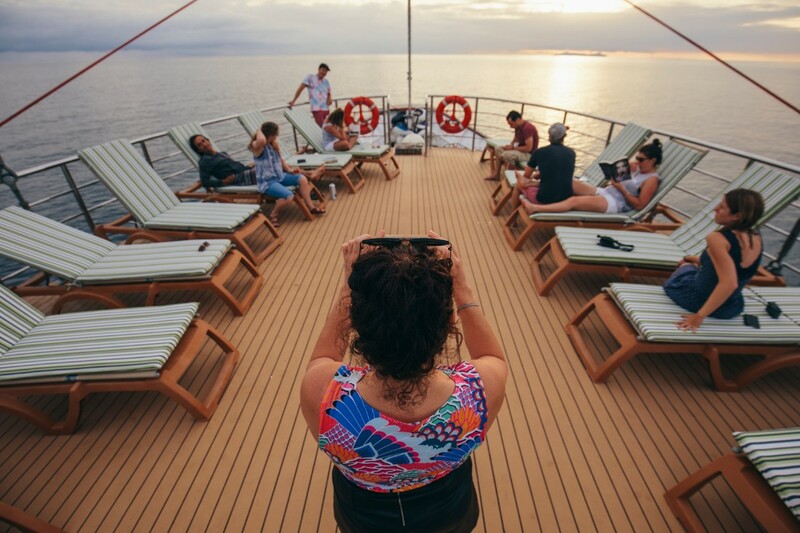 Turns out Adventure Cruising is what’s ticking my boxes. 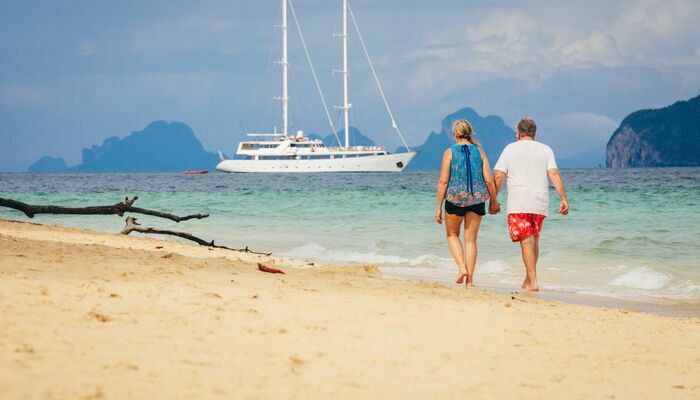 Explore Thailand and beyond on an Adventure Cruise now. 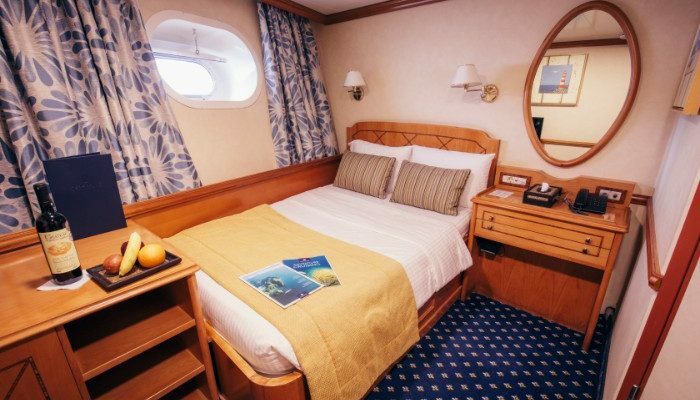 View our full range of cruises here. Some people hate long train/plane/bus rides when travelling. I love them. What's not to like about new places, new experiences, and watching 24 hours of movies back-to-back without anyone thinking it's weird.